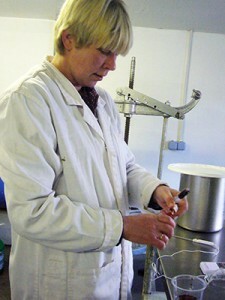 The Red Devon Cheese company has come about over the past eight years, as a result of combining our weekend cheese making courses, and the development of a range of unique cheeses produced at the farm exclusively from milk from our own herd of Devon crossed, Shorthorn and Channel Island cows. This produces milk for high quality cheese making. The cheese production is seasonal, to fit in with the grass growing period. The cows graze permenant pastures, our husbandry is based on strong organic principles, although we choose not to be,certified by the soil association anymore. We continue to farm in a sustainable way, as we have done for over 25 years. This all contributes to the wealth of flavour found in our cheese. The cheese courses are run separately to production, but during the same months of the year from April to November. I have been lucky enough to spend most of my working life involved with dairy cows in one way or another, whether it be milking them, making cheese, yogurt, butter or bottling and delivering milk to the doorstep. My fascination, some might say obsession with cheese, began over 30 years ago when I milked sheep for a short while on a farm in Hampshire. Later, on an organic farm in Berkshire I began making cheese as a hobby and trained in dairy science and cheesemaking practise. I married a dairy farmer in 1989 and shortly after we began processing milk and making cheese on the farm, I have enjoyed teaching people to make cheese for many years; sharing my knowledge and experience in the art of cheese making and hopefully helping them to avoid some of the mistakes and pitfalls that are inevitable along the way.